Today’s pickup truck segment is filled with capability, performance, and style. More so than ever before, drivers have the opportunity to get everything they want out of their pickups without having to sacrifice one thing over another. Less than a decade ago, trucks were designed and manufactured to be tough workhorses, and not the amenity-filled pickups we see today. Truck drivers are still given more than enough opportunity to choose a pickup with only the bare necessities, but with so many fun and affordable ways to invigorate your ride – why wouldn’t you just go for it? Nowadays, utility and capability in Chevy trucks for sale extend much further than what sits under the hood. While engine power is important, modern day pickup truck buyers need their trucks to be a chameleon that is able to transition from one task to another with ease. For the 2017 model year, there are more choices of capable pickup trucks in the Chevrolet lineup than ever before. Ranging in size, power, and price – there has never been a better time to purchase that perfect Chevy pickup. Whether you want all of the on-board amenities available, or a simple truck capable of getting the work done right, the bowtie brand has it all. 2017 Chevy Colorado – This midsize truck offers an impressive 31 miles per gallon on the highway, along with a max payload capacity of 1,540 pounds, and a max towing capacity of 7,700 pounds. The most affordable truck in Chevy’s lineup, the Colorado, starts at just $20,055. 2017 Chevy Silverado 1500 – Voted the most dependable, longest-lasting full-size pickup truck in America, the Silverado 1500 is a full-size truck with a full-size heart. Starting at $27,585, the 2017 Silverado 1500 offers an available class-leading towing capacity of 12,500 pounds, along with an EPA-estimated fuel economy of 24 miles per gallon. Drivers can choose from three capable engine options, along with an array of creature comforts and performance upgrades. 2017 Chevy Silverado 2500HD – The next pickup in Chevy’s lineup is the more powerful Silverado 2500HD. Starting at $33,310, this particular truck can tow up to 18,100 pounds, and boasts an impressive torque rating of up to 910 lb.-ft. These higher ratings are associated with the new 6.6-liter Turbo-Diesel Duramax engine, which gives the truck a whole new look, feel, and boost in capability. 2017 Silverado 3500HD – The most powerful truck offered by Chevrolet in 2017 is the Silverado 3500HD. Starting at just $34,410, this pickup can tow up to 23,300 pounds, and features a max payload rating of 7,153 pounds. Named the “Most Dependable Large Heavy Duty Pickup, Two Years in a Row” by JD Power, the 3500HD is the pickup truck for the driver who truly needs the best of what this segment has to offer. Whether you are a current Chevy pickup truck owner, or are looking to purchase a new one in 2017, there are plenty of great choices that will help you maximize utility, capability, and productivity on the jobsite. Check out the list of available accessories that you can add to your current truck for increased productivity and function, or include on your new 2017 Chevy pickup purchase. Bed Extender: If you want a smaller bed on your pickup truck, but will need the extra length from time to time, this is a must-have accessory. 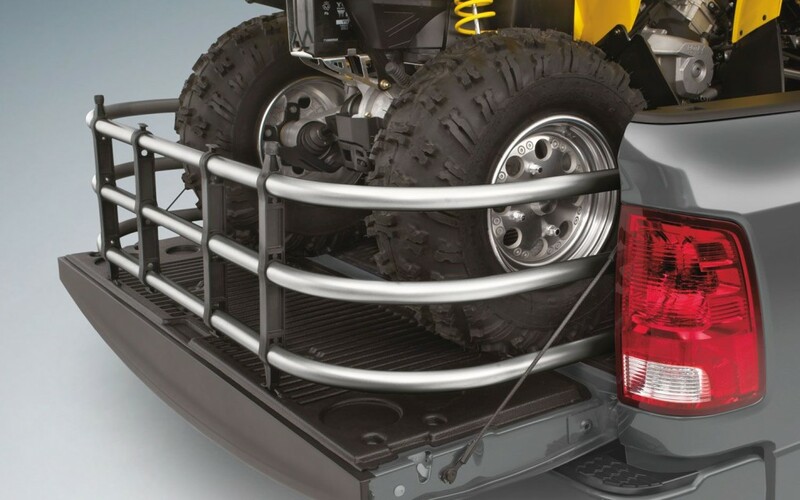 This Bed Extender is designed to swing out and provide functional length to your open tailgate on all Silverado models. Whether your truck bed is half-size, full-size, or somewhere in between, the bed extender is a great way to maximize your truck’s cargo potential for larger loads. If you don’t need it as a bed extender, this same system can work to separate your cargo space in half. It works with bedliners, as well as tonneau covers. Bed Net: For drivers who are constantly hauling smaller items in their truck beds, this optional bed net can be a great tool for added peace of mind out on the open highway. The bed net helps secure items in your open truck bed, and is composed of heavy duty shock cords that connect to the integrated steel hook system on all Chevy truck beds. LED Bed Lighting: If your day does not end when the sun sets, then this optional accessory is the companion you need to finish the job right. Perimeter Bed Lighting is installed by professional technicians, and lights up the entirety of your truck bed for better sight, even at night. Tool Box: Every working professional needs an integrated tool box in his or her pickup truck. Able to store up to 250 pounds of tools and equipment, this built-in stationary tool box can be added to any Chevy truck bed without having to drill or punch any unsightly holes. It features a lock and key so that your prized possessions are safely secured at all times. Truck Tent: Whether you enjoy camping in the great outdoors, or simply need relief from the natural elements while out on a jobsite, the optional Truck Tent is the perfect accessory. Made out of lightweight waterproof nylon material, this sports tent converts your Chevy truck into a camper within minutes. Easy to set up and take down, this tent offers the perfect reprieve from the grueling summer heat on those outdoor job sites. Push Up Tie Downs: Built into the top sides of your truck bed rails, these stake pocket push up tie downs pop up when you need them, and stow away when you don’t. This convenient accessory can be installed by your Chevrolet dealer on your new pickup, or your current Chevy truck. Your pickup truck is an extension of who you are, and has the ability to make your life much easier with the right tools. If you want to maximize your Chevy pickup truck’s utility and productivity, come down to DePaula Chevrolet and speak with one of our expert team members. We will get your truck up to speed on all of these additional accessories that truck drivers are considering critical to their daily working lives.